Help Us Keep Greenbelt Green! Recycle toothbrushes and oral care packages! Please recycle toothbrushes along with their packaging and empty toothpaste tubes. You may take used toothbrushes, plastic packaging, toothpaste tubes and their caps and empty dental floss containers to the City of Greenbelt, Public Works Department. Did you know that you should replace your toothbrush every 3 months? According to the American Dental Association, after 3-4 months, toothbrushes become worn out and frayed and may lose their effectiveness. Their dental research shows that new toothbrushes remove more plaque than old ones. Recycle toothbrushes. empty toothpaste tubes and floss containers. At McCarl Dental Group we have participated in the Greenbelt recycling program since it started and are excited to embrace this new recycling program for oral care products. We encourage our dental patients to recycle empty toothpaste tubes and caps, toothbrushes, toothpaste cartons and toothbrush outer packaging and dental floss containers. There are new inside bins at the City of Greenbelt, Public Works Department, who participates with TerraCycle, a recycling company that specializes in recycling hard-to-recycle waste. 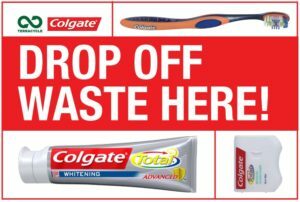 We encourage all of our dental patients and Greenbelt residents to recycle all of the oral hygiene supplies listed above. Please note: Electric toothbrushes, battery toothbrushes, and/or their parts are not recyclable through this program. Our City of Greenbelt is a certified Sustainable Maryland Community and does a great job helping residents minimize their environmental impact through recycling. The community has been in partnership with the Green Team since 2014 and has been surveyed by Green ACES (Advisory Committee on the Environment and Sustainability) for decades. Please help us actively promote and model environmental sustainability and contribute to a green lifestyle.